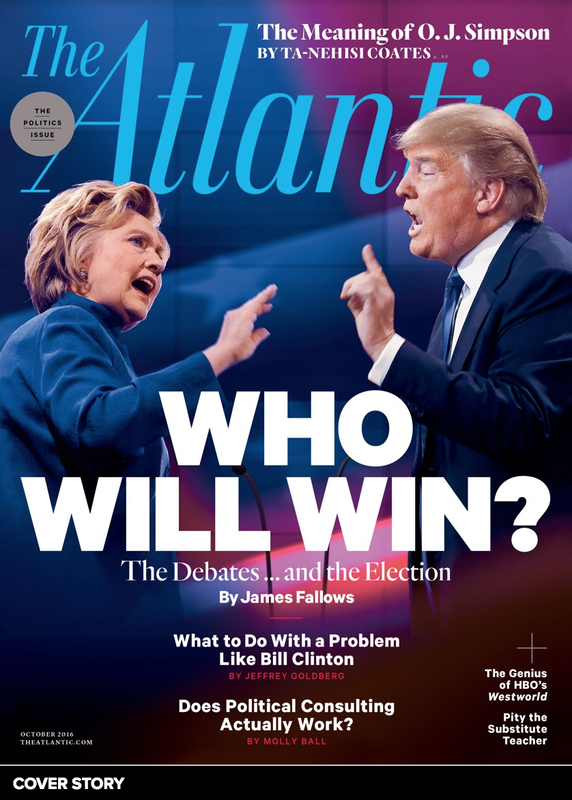 This interview took place on 24 July 2016 - on the first day of Democratic National Convention - about six weeks after the Trump Tower meeting - and two days after WikiLeaks' release of 19,000 hacked Democratic National Committee (DNC) emails. 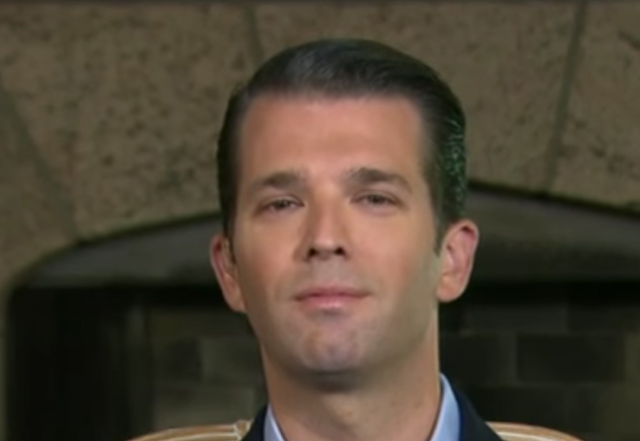 What follows is a partial nonverbal, verbal, and paralanguage analysis of Donald Trump Jr.'s behavior, concentrating on the first 95 seconds of this video. JAKE TAPPER (continuing at 0:08): So, ahum, I don't know if you were hearing earlier, but ah, Robby Mook (SP? ), the campaign manager for Secretary of State, Hillary Clinton - I asked him about the DNC leak and he suggested, ah, that experts are saying that Russians were behind both the, the leak - that, that the hacking, ah, of the DNC emails and their release. He seemed to be suggesting Ω, ah, that this is part of a plot to ∆ - help Donald Trump § and hurt Hillary Clinton ¶. Your response. 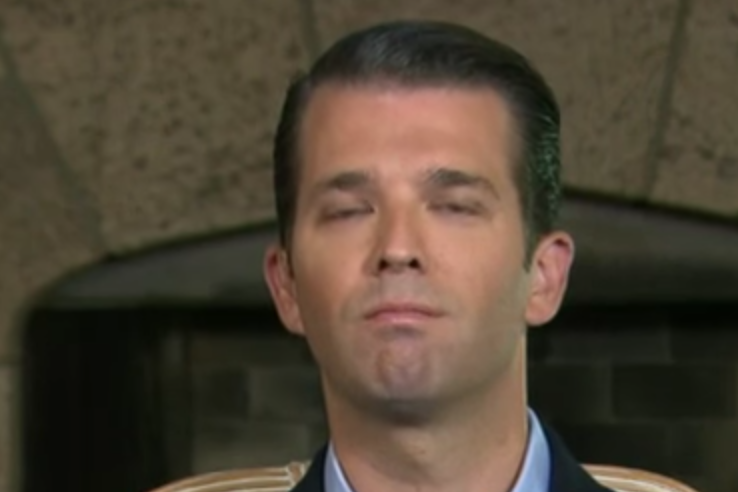 Note that about one second after Jake Tapper says the word, "Russians", Donald Trump Jr.'s rate of blinking dramatically increases for several seconds (during 0:23 - 0:27). A sudden increase in blinking frequency (over baseline) is strongly correlated with anxiety. During 0:26 - 0:27, although he tries to suppress it, Donald Trump Jr. smiles. He simultaneously shakes his head from side-to-side while blushing. Blushing in the face of a partially suppressed smile is a profound red flag. This is very much an example of classic B-grade acting of pseudo-disgust. It screams guilt and deception. A person will (subconsciously) shake their head in such a setting because this physical activity will tend to break them out of a facial expression which they know makes them look guilty. This moment of failed, suppressed smiling is obvious - but let's look again in more detail. The image above was captured at 0:25, as Jake Tapper was saying, "... the ...". This is a textbook example of a microexpression of Duping Delight. A microexpression is an extremely brief, but highly significant display of emotion. 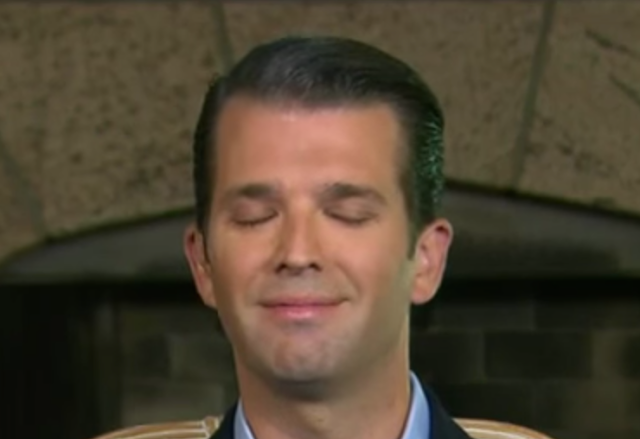 When you first see this, you might describe it as a "twitch" of Trump Jr.'s left cheek and lip. But it doesn't stop here. During the early portions of this interview, while Mr. Tapper is asking his question, Trump Jr. displays an entire series of Microexpressions (and near-microexpressions) of duping delight. Duping delight is the name given to the display of emotion by variations of subtly smiling which are seen when a person is experiencing joy-happiness in their belief that they have fooled you (duped you) in their effort to perpetrate a deception. These are excellent examples - both of duping delight and microexpressions (and near-microexpressions), so take a moment to watch them several times (for they're impossible to capture in still images). First, watch with the sound on and at regular speed. Next, mute the sound and watch it at 1/2 and 1/4 speeds. Then watch it again at regular speed with the sound back on. Repeat this cycle a few times and view it a couple times a day for a week and periodically thereafter. 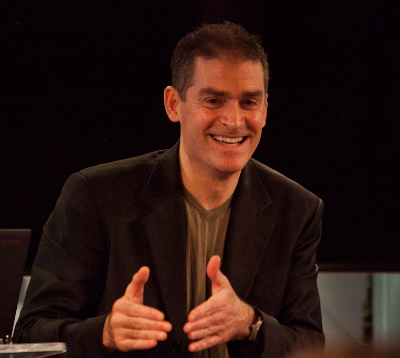 You'll notice your ability to spot microexpressions in real time will be considerably improved. Of course, not all microexpressions are of the duping delight variety. But virtually all emotions may be manifested in this subtle and fleeting, yet highly significant, manner. Some of these dynamic expressions last slightly longer than is considered, by strict definition, to be a microexpression - but don't let this temporal technicality diminish the value of these tells. Donald Trump Jr. displays one of theses slightly longer, near-microexpressions, during 0:28 as Jake Tapper says, "their release". In this moment he's trying to suppress his smile by clenching his jaw muscles. Note his jaw is also jutting forward as the muscles on the front portion of his chin contract. During 0:30, Donald Trump Jr. displays yet another microexpression of suppressed duping delight just after Jake Tapper says the word "suggesting" (notated above by the Ω symbol). And another jaw-clenching attempt at suppressing his smile occurs during 0:32, just after Tapper says, "this is part of a plot to" (notated by the ∆ symbol). Tapper's words also elicit an extended blink of anxiety. Again, jaw jutting and muscle contraction and subsequent chin dimpling are displayed. 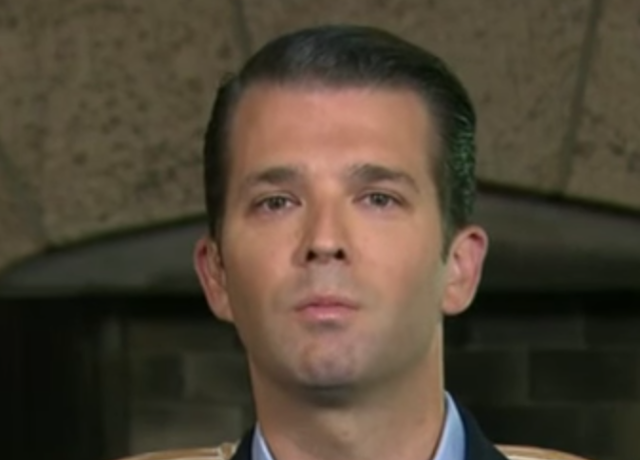 During 0:33, just after Tapper says, "help Donald Trump", Trump Jr., displays another variety of a microexpression, that of a Forward Lip Purse - indicating a withheld thought and/or clandestine plan ( § symbol). Just after Tapper says, "and hurt Hillary Clinton" (during 0:35 and noted by the ¶ symbol), still another suppressed smile is visible. Donald Trump Jr. is also displaying a second, less prominent example of a forward lip purse in this instant. Just before he answers Tapper (during 0:37 and notated with the ∂ symbol), Trump Jr. exhibits what is known as a Loose Tongue Jut - indicating the thought-emotions of "I've been bad", "I've been caught", "I've done a stupid thing" (Navarro). Not to be overlooked, is Donald Trump Jr.'s verbal denial - it's melodramatic. He's giving only his opinions - not citing facts. When examined in isolation, such a hyperbolic response, does not on its own indicate deception - but it should, in many cases, raise suspicions. Such a verbal retort is analogous to a chef adding heavy sauce to steak - hoping you won't notice that it's a bit burnt. Remember, Donald Trump Jr. is not being accused of anything here. This interview took place about six weeks after the Trump Tower meeting - but a full year before the public became aware of this now infamous Russians rendezvous. Are we to believe that Trump Jr.'s extreme response to Tapper's question is directed at the Clinton campaign staff? While they were his opponents, the magnitude of Trump Jr.'s words is very much out of context. 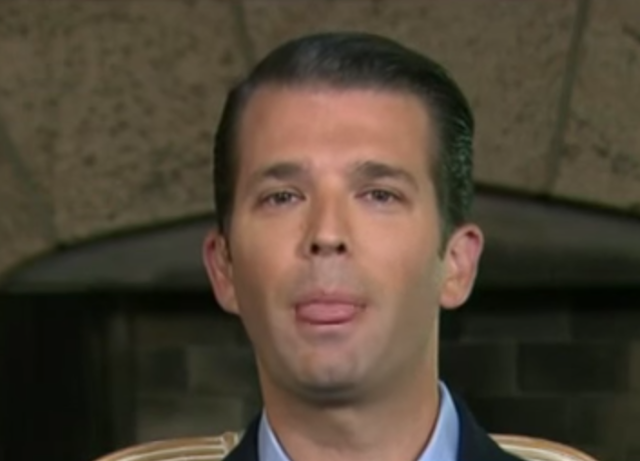 SUMMARY: Donald Trump Jr.'s nonverbal, verbal, and paralanguage behaviors displayed in this video indicate his responses were probably not due to his yet undiscovered Trump Tower meeting - but were instead, and with high probability, indications that he had foreknowledge of the Russian plan to hack the Democratic National Committee.